Gentoo Forums :: View topic - X graphics skewed/broken - Xorg or Nvidia? nvidia_modeset? X graphics skewed/broken - Xorg or Nvidia? nvidia_modeset? Posted: Tue Jul 12, 2016 1:14 am Post subject: X graphics skewed/broken - Xorg or Nvidia? nvidia_modeset? On a new install, I am having issues with my X session. As seen in the picture, my Xterm window is smushed, skewed, and there are some video artifacts. In trouble shooting, I am baffled and not sure if its Xorg or Nvidia drivers that are the issue. I don't see Errors in the Xlog. However, after I exit the X session I do see `modprobe: ERROR: could not insert 'nvidia_modeset': Operation not permitted` which is confusing, since I do not have nvidia framebuffer enabled in the kernel. Ay ideas what is causing this? xterm: fatal IO error 11 (Resource temporarily unavailable) or KillClient on X server ":0"
[ 167.057] (==) Using config file: "/etc/X11/xorg.conf"
[ 167.057] (==) Using config directory: "/etc/X11/xorg.conf.d"
[ 167.057] (==) Using system config directory "/usr/share/X11/xorg.conf.d"
[ 167.058] (==) ServerLayout "X.org Configured"
[ 167.058] (**) | |-->Monitor "Monitor0"
[ 167.058] (**) | |-->Device "Card0"
[ 167.058] (**) |-->Input Device "Mouse0"
[ 167.058] (**) |-->Input Device "Keyboard0"
[ 167.058] (WW) The directory "/usr/share/fonts/TTF/" does not exist. [ 167.058] Entry deleted from font path. [ 167.058] (WW) The directory "/usr/share/fonts/OTF/" does not exist. [ 167.058] (WW) The directory "/usr/share/fonts/Type1/" does not exist. [ 167.058] (WW) `fonts.dir' not found (or not valid) in "/usr/share/fonts/100dpi/". [ 167.058] (Run 'mkfontdir' on "/usr/share/fonts/100dpi/"). [ 167.058] (WW) `fonts.dir' not found (or not valid) in "/usr/share/fonts/75dpi/". [ 167.058] (Run 'mkfontdir' on "/usr/share/fonts/75dpi/"). [ 167.058] (**) ModulePath set to "/usr/lib64/opengl/nvidia,/usr/lib64/xorg/modules,/usr/lib64/xorg/modules"
[ 167.058] (WW) Hotplugging is on, devices using drivers 'kbd', 'mouse' or 'vmmouse' will be disabled. [ 167.059] (II) "glx" will be loaded. This was enabled by default and also specified in the config file. [ 167.059] (II) LoadModule: "glx"
[ 167.064] (II) Module glx: vendor="NVIDIA Corporation"
[ 167.064] (II) LoadModule: "nvidia"
[ 167.065] (II) Module nvidia: vendor="NVIDIA Corporation"
[ 167.072] (II) Loading sub module "fb"
[ 167.072] (II) LoadModule: "fb"
[ 167.072] (II) Module fb: vendor="X.Org Foundation"
[ 167.072] (II) Loading sub module "wfb"
[ 167.072] (II) LoadModule: "wfb"
[ 167.073] (II) Module wfb: vendor="X.Org Foundation"
[ 167.073] (II) Loading sub module "ramdac"
[ 167.073] (II) LoadModule: "ramdac"
[ 167.469] (II) NVIDIA(0): "NULL"
[ 167.469] (WW) NVIDIA(0): Unable to get display device for DPI computation. [ 167.477] (II) NVIDIA: access. [ 167.480] (II) NVIDIA(0): Config Options in the README. [ 167.499] (II) NVIDIA(0): Built-in logo is bigger than the screen. [ 167.499] (II) NVIDIA(0): Setting mode "NULL"
[ 167.503] (II) Loading sub module "x11glvnd"
[ 167.503] (II) LoadModule: "x11glvnd"
[ 167.503] (II) UnloadModule: "x11glvnd"
[ 167.503] (II) Loading sub module "dri2"
[ 167.503] (II) LoadModule: "dri2"
[ 167.504] (II) Indirect GLX disabled. [ 167.547] (**) Power Button: Applying InputClass "evdev keyboard catchall"
[ 167.547] (II) LoadModule: "evdev"
[ 167.548] (II) Module evdev: vendor="X.Org Foundation"
[ 167.548] (**) evdev: Power Button: Device: "/dev/input/event1"
[ 167.548] (**) Option "config_info" "udev:/sys/devices/LNXSYSTM:00/LNXPWRBN:00/input/input1/event1"
[ 167.548] (**) Option "xkb_rules" "evdev"
[ 167.548] (**) Option "xkb_model" "pc104"
[ 167.548] (**) Option "xkb_layout" "us"
[ 167.572] (**) Power Button: Applying InputClass "evdev keyboard catchall"
[ 167.572] (**) evdev: Power Button: Device: "/dev/input/event0"
[ 167.572] (**) Option "config_info" "udev:/sys/devices/LNXSYSTM:00/LNXSYBUS:00/PNP0C0C:00/input/input0/event0"
[ 167.572] (**) Option "xkb_rules" "evdev"
[ 167.572] (**) Option "xkb_model" "pc104"
[ 167.572] (**) Option "xkb_layout" "us"
[ 167.572] (**) PIXART USB OPTICAL MOUSE: Applying InputClass "evdev pointer catchall"
[ 167.572] (**) evdev: PIXART USB OPTICAL MOUSE: Device: "/dev/input/event2"
[ 167.573] (**) Option "config_info" "udev:/sys/devices/pci0000:00/0000:00:12.2/usb1/1-4/1-4.1/1-4.1:1.0/0003:093A:2510.0002/input/input3/event2"
[ 167.573] (II) evdev: PIXART USB OPTICAL MOUSE: initialized for relative axes. [ 167.573] (II) No input driver specified, ignoring this device. [ 167.573] (II) This device may have been added with another device file. [ 167.573] (**) Generic Wired USB Keyboard: Applying InputClass "evdev keyboard catchall"
[ 167.573] (**) evdev: Generic Wired USB Keyboard: Device: "/dev/input/event3"
[ 167.573] (**) Option "config_info" "udev:/sys/devices/pci0000:00/0000:00:12.2/usb1/1-4/1-4.4/1-4.4.4/1-4.4.4:1.0/0003:0D62:0171.0003/input/input4/event3"
[ 167.573] (**) Option "xkb_rules" "evdev"
[ 167.573] (**) Option "xkb_model" "pc104"
[ 167.573] (**) Option "xkb_layout" "us"
[ 167.574] (**) Generic Wired USB Keyboard: Applying InputClass "evdev keyboard catchall"
[ 167.574] (**) evdev: Generic Wired USB Keyboard: Device: "/dev/input/event4"
[ 167.574] (**) Option "config_info" "udev:/sys/devices/pci0000:00/0000:00:12.2/usb1/1-4/1-4.4/1-4.4.4/1-4.4.4:1.1/0003:0D62:0171.0004/input/input5/event4"
[ 167.574] (**) Option "xkb_rules" "evdev"
[ 167.574] (**) Option "xkb_model" "pc104"
[ 167.574] (**) Option "xkb_layout" "us"
[ 173.181] (II) UnloadModule: "evdev"
[ 173.707] (II) Server terminated successfully (0). Closing log file. USE="3dnow 3dnowext X acl acpi alsa amd64 berkdb bzip2 cairo cli cracklib crypt cxx dri evdev flac fortran fuse gdbm gimp git glitz gnutls gtk iconv icu iso14755 joystick jpeg jpeg2k lame mms mmx mmxext modules mp3 mpeg multilib ncurses nls nptl nvidia ogg opengl openmp pam pcre png qt3support qt4 readline seccomp session sse sse2 sse3 sse4a ssl svg tcpd tiff truetype udev unicode wavpack x264 xattr xcb zlib" ABI_X86="64" ALSA_CARDS="maestro3 usb-usx2y wavefront" APACHE2_MODULES="authn_core authz_core socache_shmcb unixd actions alias auth_basic authn_alias authn_anon authn_dbm authn_default authn_file authz_dbm authz_default authz_groupfile authz_host authz_owner authz_user autoindex cache cgi cgid dav dav_fs dav_lock deflate dir disk_cache env expires ext_filter file_cache filter headers include info log_config logio mem_cache mime mime_magic negotiation rewrite setenvif speling status unique_id userdir usertrack vhost_alias" CALLIGRA_FEATURES="kexi words flow plan sheets stage tables krita karbon braindump author" CAMERAS="ptp2" COLLECTD_PLUGINS="df interface irq load memory rrdtool swap syslog" CPU_FLAGS_X86="mmx mmxext sse sse2" ELIBC="glibc" GPSD_PROTOCOLS="ashtech aivdm earthmate evermore fv18 garmin garmintxt gpsclock itrax mtk3301 nmea ntrip navcom oceanserver oldstyle oncore rtcm104v2 rtcm104v3 sirf superstar2 timing tsip tripmate tnt ublox ubx" INPUT_DEVICES="evdev virtualbox" KERNEL="linux" LCD_DEVICES="bayrad cfontz cfontz633 glk hd44780 lb216 lcdm001 mtxorb ncurses text" LIBREOFFICE_EXTENSIONS="presenter-console presenter-minimizer" OFFICE_IMPLEMENTATION="libreoffice" PHP_TARGETS="php5-5" PYTHON_SINGLE_TARGET="python2_7" PYTHON_TARGETS="python2_7 python3_4" RUBY_TARGETS="ruby20 ruby21" USERLAND="GNU" VIDEO_CARDS="nvidia" XTABLES_ADDONS="quota2 psd pknock lscan length2 ipv4options ipset ipp2p iface geoip fuzzy condition tee tarpit sysrq steal rawnat logmark ipmark dhcpmac delude chaos account"
Do you have set "nvidia" to /etc/modprobe.d/blacklist.conf file? Whats up with those ACPI errors? Any reason why you use an antique kernel? In my expierience nvidia-drivers binary only works with a certain set of xorg-server and kernels combinations. What is the content and please list each file with cat of this directory? You're not asking any resolution from what i see, if you want some auto pickup resolution, you have to set some nvidia-autoselect mode. It goes with a 640x480, a resolution your monitor may not really like to run in. So i would say, try looking in your xorg.conf and fix it, because "NULL" is a valid resolution keyword for nvidia, and it really mean: do not use that monitor ; ie: 1680x1050, NULL mean set monitor 1 to 1680x1050 and disable monitor 2.
tw04l124: nvidia acpi are not errors, user can fix the messages by running acpid but it's just info anyway. I notice you always push anyone to update for no reason except that update mean good for you. 3.18 kernel is not antique, 3.18 kernel is an LTS kernel. I think the resolution is the root issue. I tried to manually force the resolution that works from my other gentoo rootfs, and the resolution will not take. Any ideas why 'Modes "1920x1080"' will not be forced and used? Option "metamodes" "DVI-D-0: nvidia-auto-select +0+0"
and if you are not sure what interface the monitor is connect to, you should drop it (DVI-D-0), been specific is good, been specific and mistaking the aiming interface is not. here's my current xorg metamodes entry. Option "MetaModes" "1680x1050_120,1680x1050_120; NULL, 1680x1050_120"
note: the 1920x1080_120 mean some define user mode, it must exist for you to use it, so your chance of success where down 0 there. Would this be a bug/issue with Nvidia or Xorg for not recognizing the MetaMode as it does on my other rootfs? [ 32.408] (==) Using config file: "/etc/X11/xorg.conf"
[ 32.408] (==) Using config directory: "/etc/X11/xorg.conf.d"
[ 32.408] (==) Using system config directory "/usr/share/X11/xorg.conf.d"
[ 32.408] (==) ServerLayout "X.org Configured"
[ 32.408] (**) | |-->Monitor "Monitor0"
[ 32.408] (==) No device specified for screen "Screen0". [ 32.408] (**) | |-->Device "Card0"
[ 32.408] (**) |-->Input Device "Mouse0"
[ 32.408] (**) |-->Input Device "Keyboard0"
[ 32.408] (WW) The directory "/usr/share/fonts/TTF/" does not exist. [ 32.408] Entry deleted from font path. [ 32.408] (WW) The directory "/usr/share/fonts/OTF/" does not exist. [ 32.408] (WW) The directory "/usr/share/fonts/Type1/" does not exist. [ 32.408] (WW) `fonts.dir' not found (or not valid) in "/usr/share/fonts/100dpi/". [ 32.408] (Run 'mkfontdir' on "/usr/share/fonts/100dpi/"). [ 32.408] (WW) `fonts.dir' not found (or not valid) in "/usr/share/fonts/75dpi/". [ 32.408] (Run 'mkfontdir' on "/usr/share/fonts/75dpi/"). [ 32.408] (**) ModulePath set to "/usr/lib64/opengl/nvidia,/usr/lib64/xorg/modules,/usr/lib64/xorg/modules"
[ 32.408] (WW) Hotplugging is on, devices using drivers 'kbd', 'mouse' or 'vmmouse' will be disabled. [ 32.410] (II) "glx" will be loaded. This was enabled by default and also specified in the config file. [ 32.410] (II) LoadModule: "glx"
[ 32.415] (II) Module glx: vendor="NVIDIA Corporation"
[ 32.415] (II) LoadModule: "nvidia"
[ 32.416] (II) Module nvidia: vendor="NVIDIA Corporation"
[ 32.423] (II) Loading sub module "fb"
[ 32.423] (II) LoadModule: "fb"
[ 32.423] (II) Module fb: vendor="X.Org Foundation"
[ 32.423] (II) Loading sub module "wfb"
[ 32.423] (II) LoadModule: "wfb"
[ 32.423] (II) Module wfb: vendor="X.Org Foundation"
[ 32.424] (II) Loading sub module "ramdac"
[ 32.424] (II) LoadModule: "ramdac"
[ 32.424] (**) NVIDIA(0): Option "Stereo" "0"
[ 32.424] (**) NVIDIA(0): Option "SLI" "Off"
[ 32.424] (**) NVIDIA(0): Option "MultiGPU" "Off"
[ 32.424] (**) NVIDIA(0): Option "BaseMosaic" "off"
[ 32.424] (**) NVIDIA(0): NVIDIA SLI disabled. [ 32.424] (**) NVIDIA(0): NVIDIA Multi-GPU disabled. [ 32.424] (**) NVIDIA(0): Option "MetaModes" "1920x1080_120"
[ 32.808] (II) NVIDIA(0): "NULL"
[ 32.808] (WW) NVIDIA(0): Unable to get display device for DPI computation. [ 32.816] (II) NVIDIA: access. [ 32.820] (II) NVIDIA(0): Config Options in the README. [ 32.838] (II) NVIDIA(0): Built-in logo is bigger than the screen. [ 32.838] (II) NVIDIA(0): Setting mode "NULL"
[ 32.842] (II) Loading sub module "x11glvnd"
[ 32.842] (II) LoadModule: "x11glvnd"
[ 32.842] (II) UnloadModule: "x11glvnd"
[ 32.842] (II) Loading sub module "dri2"
[ 32.842] (II) LoadModule: "dri2"
[ 32.842] (II) Indirect GLX disabled. [ 32.886] (**) Power Button: Applying InputClass "evdev keyboard catchall"
[ 32.886] (II) LoadModule: "evdev"
[ 32.887] (II) Module evdev: vendor="X.Org Foundation"
[ 32.887] (**) evdev: Power Button: Device: "/dev/input/event1"
[ 32.887] (**) Option "config_info" "udev:/sys/devices/LNXSYSTM:00/LNXPWRBN:00/input/input1/event1"
[ 32.887] (**) Option "xkb_rules" "evdev"
[ 32.887] (**) Option "xkb_model" "pc104"
[ 32.887] (**) Option "xkb_layout" "us"
[ 32.911] (**) Power Button: Applying InputClass "evdev keyboard catchall"
[ 32.911] (**) evdev: Power Button: Device: "/dev/input/event0"
[ 32.911] (**) Option "config_info" "udev:/sys/devices/LNXSYSTM:00/LNXSYBUS:00/PNP0C0C:00/input/input0/event0"
[ 32.911] (**) Option "xkb_rules" "evdev"
[ 32.911] (**) Option "xkb_model" "pc104"
[ 32.911] (**) Option "xkb_layout" "us"
[ 32.911] (**) PIXART USB OPTICAL MOUSE: Applying InputClass "evdev pointer catchall"
[ 32.911] (**) evdev: PIXART USB OPTICAL MOUSE: Device: "/dev/input/event2"
[ 32.911] (**) Option "config_info" "udev:/sys/devices/pci0000:00/0000:00:12.2/usb1/1-4/1-4.1/1-4.1:1.0/0003:093A:2510.0002/input/input3/event2"
[ 32.911] (II) evdev: PIXART USB OPTICAL MOUSE: initialized for relative axes. [ 32.912] (II) No input driver specified, ignoring this device. [ 32.912] (II) This device may have been added with another device file. [ 32.912] (**) Generic Wired USB Keyboard: Applying InputClass "evdev keyboard catchall"
[ 32.912] (**) evdev: Generic Wired USB Keyboard: Device: "/dev/input/event3"
[ 32.912] (**) Option "config_info" "udev:/sys/devices/pci0000:00/0000:00:12.2/usb1/1-4/1-4.4/1-4.4.4/1-4.4.4:1.0/0003:0D62:0171.0003/input/input4/event3"
[ 32.912] (**) Option "xkb_rules" "evdev"
[ 32.912] (**) Option "xkb_model" "pc104"
[ 32.912] (**) Option "xkb_layout" "us"
[ 32.913] (**) Generic Wired USB Keyboard: Applying InputClass "evdev keyboard catchall"
[ 32.913] (**) evdev: Generic Wired USB Keyboard: Device: "/dev/input/event4"
[ 32.913] (**) Option "config_info" "udev:/sys/devices/pci0000:00/0000:00:12.2/usb1/1-4/1-4.4/1-4.4.4/1-4.4.4:1.1/0003:0D62:0171.0004/input/input5/event4"
[ 32.913] (**) Option "xkb_rules" "evdev"
[ 32.913] (**) Option "xkb_model" "pc104"
[ 32.913] (**) Option "xkb_layout" "us"
Told you in my previous post, because of the added _120 it mean it's a modeline, and if the modeline doesn't exists, an invalid mode. [ 12.578] (**) NVIDIA(0): Option "MetaModes" "1680x1050_120,1680x1050_120; NULL, 1680x1050_120"
I don't know why the card isn't checking display, did you check your cable is good? You should also reenable mosaic. Ya, this is the same PC as my other old gentoo root filesystem, where X works. I have two seperate harddrives where I am switching back and forth for root file systems(old gentoo system and the new one I am building). So all hardware is the same. If I filed a bug would it be Nvidia or X? [ 25.259] (**) NVIDIA(0): NVIDIA Multi-GPU disabled. [ 25.259] (**) NVIDIA(0): Option "MetaModes" "DVI-D-0: nvidia-auto-select +0+0"
[ 25.634] (II) NVIDIA(0): stereo. [ 25.717] (WW) NVIDIA(GPU-0): HorizSync check for mode "1920x1080". 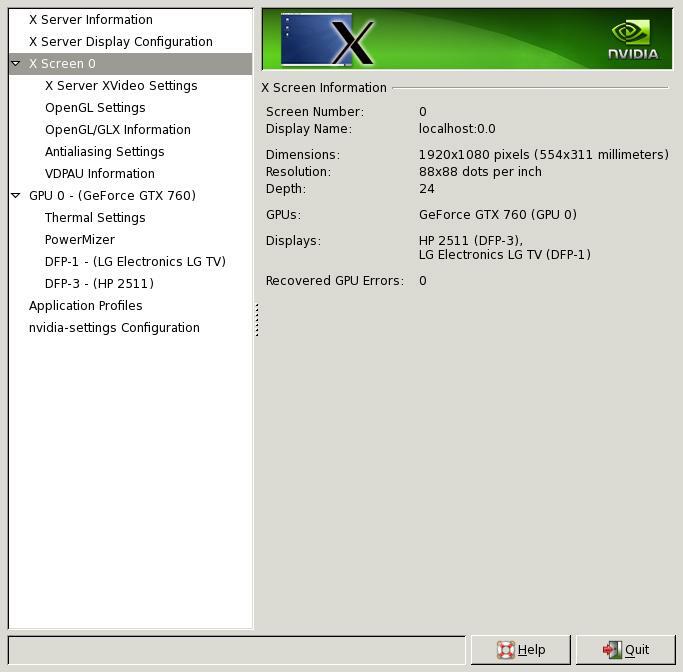 [ 25.717] (WW) NVIDIA(GPU-0): VertRefresh check for mode "1920x1080". [ 25.720] (II) NVIDIA(0): "DVI-D-0:nvidia-auto-select+0+0"
I don't think you should "already" report, but if you do, must be against nvidia drivers as it is them that fail to get your display. You should recheck nvidia readme and look at features that must be present in kernel, and features that disturb them and that should be removed. Ok, so I have some exciting news after much pain without pleasure. With the Nvidia drivers 361.28 : 0 the uvesa resolution from grub `video=uvesafb:mtrr:3,ywrap,1920x1080-32 ` was skewing the resolution. I removed that from grub, and then that fixed the resolution issue. However, the graphics were stilled hosed with video artifacts everywhere filling my whole monitor viewport/screen. I kept downgrading Nvidia drivers increments of stable releases. I got to x11-drivers/nvidia-drivers-355.11-r2 and my X session worked with no issues. In addition, it worked with 'video=uvesafb:mtrr:3,ywrap,1920x1080-32' from grub. Should I file a bug with Gentoo bugzilla or is there a nvidia repo I need to file with? I reported a few nvidia bugs. No reply after inital answer from them. Nvidia also has a support forum, you may ask there also first.